Last week saw J become an official part of girl guiding. She took her rainbow promise. I was a brownie when I was younger, and although I can not remember much of it apart from the hideous brown calottes, I remember being told that I could no longer be a brownie due to my behaviour. I later re-joined as a girl guide and those memories I do remember. They were filled with giggles, learning new skills that sometimes can not be taught at school and gave me something to do after school apart from just "chilling out". J started along the girl guide route just after Easter when a spot opened up for her. She had been on the waiting list for almost 6 months and was thrilled when we told her it was now her time. She didn't really know what to expect as she joined, but two other girls from her class also joined on the same day so she felt comfortable taking a leap into the unknown. I stayed behind on the first session and just watched. The room was filled with giggles as they played games and gossiped. A supervised and messy craft was set up and they were allowed to get knee and even head deep into glitter. She loved it. The following weeks she would be so excited to go and then two weeks ago she had a promise to learn for the following week. She did so well at practicing it that on the day she shouted it to the roof tops on the way to school. We were invited into rainbows to watch her make her promise. 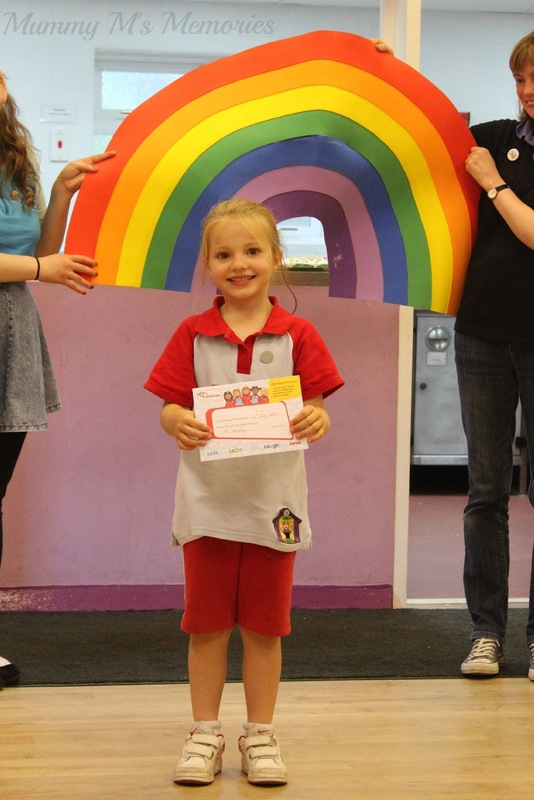 She was led by a fellow rainbow to the rainbow, where she then walked underneath, said her promise, and then was awarded with the badge and certificate. That's it, she is a Girl Guiding Rainbow. I was a Girl Guide and I loved every minute of it - some great memories being brought back now! Another lovely post!